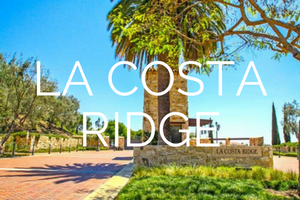 La Costa Ridge offers 262 homes, set into 4 distinct neighborhoods that are reminiscent of Italian villages. Homes range from 2500 to over 5300 square feet, and the community is served by the San Marcos School District. Floor plans sit atop one of the highest elevations in Carlsbad, and it is the only gated, master-planned community in Carlsbad. Walking trails, restaurants, and shopping are nearby.